At first I was wondering: Why is Donald Trump sending out all those stupid tweets about “voter fraud”? I’m sure he’s been briefed, so it’s clear he has access to the same data that everyone else has — probably more. Surely, therefore, he knows none of that is real. At first I kept thinking “OK then, what’s Trump up to? He must know that everybody knows he’s just making this stuff up.” I was looking for some sort of plan, a coherent strategy. But then I realized that no, there is no plan. He just makes stuff up because he can. It’s like we’ve handed a loaded gun to a little kid. A very, very big gun. Technically, the man in that tower is 70 years old. But I think we need to start dealing with something more deeply true: In any meaningful sense, the person we’re dealing with is a 12 year old kid. I was looking out over the water yesterday near sunset in the great Pacific Northwest, and I found myself wanting to describe to a friend how beautiful it was. 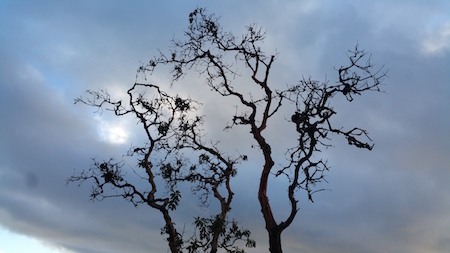 Just then, I looked up and saw an Arbutus tree framed against the darkening sky. The image matched my mood at that moment: complex, and not in an easily resolvable way. I found myself thinking that maybe that is simply what it means to be human — complexity that can not always be put into words. So instead of words, I sent the image. My friends in Canada tell me that the ousted conservatives are trying to make a comeback by working from Donald Trump’s playbook. Some are trying to point to the Trudeau family charitable foundation as a conflict of interest for Justin Trudeau (just as the Trump campaign did to Hillary Clinton). Others are saying that in the age of Trump, Canada needs a strongman at the helm, not a nice guy. There is a push to return to the disastrously fragile oil based economy that got Harper thrown out. The way I see it, Canada’s great opportunity lies in the opposite direction. It wasn’t just a majority of U.S. voters who voted for Hillary Clinton — it was, more specifically, a supermajority of college educated voters. There are many brilliant Americans — writers, inventors, artists, architects, filmmakers, neuroscientists, game designers, engineers, software experts, and more — who right now would jump at the chance to take a sabbatical north of the border. We’re not talking about giving up U.S. citizenship, just taking a little time. Imagine the boost to Canada’s economy if much of that brain trust came to visit over the next four years. The Canadian government wouldn’t need to do much: just reach out a welcoming hand, maybe provide a few tax breaks, some grants for cooperative research. It’s not like the U.S. would miss them. If I understand the Trump administration’s focus, it’s going to put its efforts into bringing back the U.S. coal industry, not on all that left-leaning intellectual stuff. And boats. They’re probably going to invest in boats. Donald Trump’s advisors are saying that his administration plans to cut NASA’s space-based climate research. Their argument, as I understand it, is that empirical data collected by NASA has the unfortunate effect of confirming that climate change is actually happening, and therefore is inherently political. It’s kind of like those annoying scientists back in the day who kept finding compelling evidence that humans and other primates have common genetic ancestors. You know, that whole evolution thing. The problem, of course, was that their research was based on actual data, which means you can’t argue with it. In short, reality is inherently evil, and it must be stopped. Well, sure, a lot of people are likely to die unnecessarily over the next four years from Hurricanes that NASA data will no longer be monitoring, but that’s a small price to pay for waging a righteous war against the evil of inconvenient reality. Yet I suspect that Trump knows exactly what he’s doing. For decades he has been doing his best to build or purchase tall buildings all along the east coast of the United States — a brilliant and prescient move, when you think about it. After all, once the rising ocean has submerged Manhattan, all of his towers will become valuable waterfront property. That’s where the real money is. That, and boats. My recommendation is to start investing in boats. Last weekend I went to my mom’s house for dinner. We knew we would see each other anyway for Thanksgiving in just another few days, but we also know that with the whole family there, Thanksgiving wouldn’t really be a good time to talk one on one. We ended up having dinner at a cozy Italian restaurant in my mom’s neighborhood. As usual, our conversation roamed over many topics. There was the obligatory post-election analysis. Fortunately for both of us, we are essentially in agreement on politics. If you manage to guess my political leanings from having read this blog (yes I know, it’s difficult), then you’ve got a good idea of my mom’s political preferences. But mostly we discussed people we knew, family, relationships, all the really important stuff. My mom is incredibly insightful about these topics, and I find myself discussing things with her that I wouldn’t talk over with anybody else. At last the check came. I took out my credit card and put it on the bill. My mom asked if she could split the cost of dinner with me. That’s when I had one of those insights that one is privileged to get every once in a while. One of those moments of clarity when the clouds of the everyday part, and the light of the Universe manages to shine through. My mother, gracious as always, bowed to the unassailable logic of this argument. She agreed to let me pay for dinner. I was having a conversation with a colleague this afternoon about the use of different media. We all know that there is a different feeling to a phone chat than there is to, say, face to face conversation. And both are very different from an exchange of letters. Every medium brings with it certain affordances. I can spend all the time I want carefully composing an email response, a luxury that I do not have in face to face conversation. On the other hand, email does not let me use facial expression, body position, gesture or voice modulation to convey subtle shades of meaning. At some point my colleague and I started talking about the phenomenon of having had a conversation, and then not being able to remember whether that conversation had been in person. Suppose, for the sake of argument, that we think of in person face to face discussion as a kind of gold standard. Then it is arguably a mark of success for any medium if that medium feels more like a conversation between two people who are physically face to face. In particular, if you’ve had a conversation over, say, Skype, and you mistakenly remember it as an in-person discussion, that would mean that Skype is doing something really well. In practice, I think, this doesn’t happen very much. A face-to-face over Skype or Google Hangouts feels very different from the real thing — and that’s how we generally remember it. But my colleague said that back when he and others were using Second Life, those who stayed in the experience for long periods of time — say, at least eight hours all together — sometimes started remembering their conversations in Second Life as having taken place in person. I think this is a very important data point. It suggests that there is something in particular about the illusion of physical co-presence — as opposed to simply seeing a face on a screen — that can trick our memory into believing that we have been physically present somewhere. We might therefore apply to conversation in any medium the “forgetting test”: After having had the conversation, how likely is it that you might mistakenly remember it as having been an actual face to face encounter? It has not escaped our notice that this question immediately suggests a possible benefit of shared immersive virtual reality. Allen Ginsburg used the phrase “First thought, best thought,” to describe the process of spontaneous and fearless writing. I find that I sometimes apply this in my own work in unexpected ways. Creating something that ends up being new and interesting often starts by throwing myself a challenge, some added constraint to an otherwise predictable task. Intuitively you might think that the added constraint would make the task more difficult. But it often turns out that adding another constraint serves as a catalyst, the grain of sand in the oyster that forces the pearl to form. Suddenly, when things are no longer rote and familiar, I need to think on my feet, to improvise, and now I am paying attention. I think it’s really this part about paying attention, about staying awake and alert to whatever might happen next, which is the true catalyst. And anything that encourages that sort of out-of-the-box thinking is good. This is not to say that coming up with some new direction is sufficient. For me at least, it is far from sufficient. What really matters is what I do with that grain of sand in the oyster. A lot depends on the hard work of follow-through, of going from the odd inspiration to an eventual result that is well thought out, worked through, properly designed. But heading off into some unexpected new direction, making sure I’m doing something I’ve never quite done before, helps make that process a lot more fun and interesting. It forces me to look at the design process with fresh eyes. And then the good stuff can happen. Well, anyway, that’s my first thought. 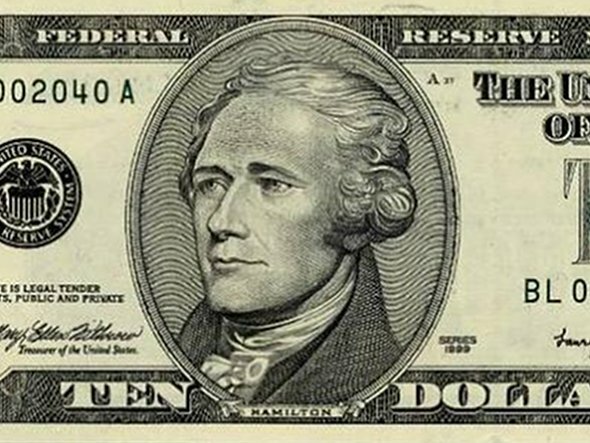 If you put two and a half million of those Hamiltons together, you get 25 million dollars. Which is how much our president-elect just paid out to settle his University fraud case. But nobody is really talking about this embarrassing admission of dishonest dealing by the future leader of our country. Why? Because something far more newsworthy came up just in time. It seems that our next Commander in Chief was deeply offended that people doing political theater were doing political theater. Enough so that he went on the attack with a Twitter storm. Before you knew it, everyone had forgotten all about the $25,000,000. By the time anybody remembers to think about that again, it will be old news. We now know, all too well, that in this new information age old news is no news. And nobody knows this better than our president-elect. Some people around here say Donald Trump is not very intelligent. But they are clearly wrong. After all, who else has the talent to put down one Hamilton in order to make 2,500,000 other Hamiltons disappear from sight? You are currently browsing the Ken’s Blog blog archives for November, 2016.